#TBT: I will NEVER go back to “BEFORE”! #TBT – My Story for those who have not read it. I will NEVER go back to “BEFORE”!! I developed Hashimoto’s (autoimmune) Hypothyroidism and was searching for a way to relieve the symptoms. I had suffered significant weight gain, severe fatigue, hormonal imbalance, sleep issues, and pain in my joints, muscles – essentially all over. My doctors were of very little help beyond initial diagnosis and prescribing Levoxyl. The medication helped, but only a little. I read a number of success stories online and was very inspired by them. I had incredible motivation in the form of a young child that needs me that made me determined. So in September 2011, I decided to give Paleo a go – and WOW did it work! And it was not nearly as difficult as I imagined it would be! Robb’s revelation that my gallbladder removal indicated undiagnosed celiac disease (p. 81 “Full of Bile” in The Paleo Solution) was very powerful. My surgeon told me I nearly died during that operation at the age of 27. If I had only known! I am not exaggerating when I say this information saved me. I’ve had a few close calls in my life that can now be attributed to gluten/celiac issues: nearly ruptured appendix, serious complications during gallbladder surgery, miscarriage, ectopic pregnancy, and Hashimoto’s (autoimmune) Thyroiditis. In addition to the Paleo dietary recommendations, I also avoid dairy and nightshades due to my autoimmunity. I also follow(ed) recommendations from GAPS (bone broth, probiotics, etc) in the healing process. My exercise consists of walking my dog and house/yard work. I no longer suffer. I look and feel great at 60+ lbs less than my heaviest/sickest point. I went from a size 16 to an 8 in one year; I look 10 years younger with my hair color/texture returning. Additional benefits: no body odor (I now use magnesium oil as my “deodorant”) and dramatic improvement in my mood, hormonal balance, and marriage! I am 45 years old, 5’10” tall, size 6/8, and weigh just under 160 lbs. Many, many thanks and much love to Robb Wolf, Mark Sisson, Tara Grant and the online Paleo community for showing me the way to heal(th)!! I truly owe them my life. I submitted this story in hopes that it will help others – both by inspiring some to try Paleo, and to encourage others to keep on. One day at a time – it all starts somewhere! I am incredibly grateful to Robb for sharing his work with us! His insights about autoimmunity were key to my recovery. At one point before diagnosis, I was so sick I could barely eat. I knew I was in big trouble, but had no idea what was happening. I hate to think where I would be if I hadn’t discovered Paleo. A very scary thought, indeed. So, kudos to all of you living the lifestyle – and pass it on! There are far too many people suffering needlessly. This entry was posted in Celiac, Health and tagged celiac, PALEO, story on June 4, 2015 by Pamela. Celiac Disease is not an allergy. It is an autoimmune disorder, just like Multiple Sclerosis or Lupus – triggered by even trace amounts of gluten proteins from wheat, barley, rye and oats in genetically susceptible individuals. Once celiac has developed, autoimmune flares can also be triggered by casein (milk protein), corn, soy and other dietary proteins. With Celiac, the immune system attacks the lining of the small intestine, causing an inability to properly absorb nutrients. Celiac manifests itself in hundreds of ways, many of which are secondary conditions due to nutrient deficiencies. A lifelong affliction that is remedied only by strict adherence to a 100% gluten-free lifestyle – food, personal care products, and even things like envelope glue! Recovery and healing the damage can take weeks, months or even years. Want to know if you’re at risk or may have Celiac Disease? Get tested. The only reliable way to know for certain is a (DNA) genetic test. Biopsies and blood tests are unreliable, and require continued gluten consumption. Gluten Free Society offers confidential testing. I believed that I had Celiac, but while pregnant last year, wanted to know for certain if I had Gluten Sensitivity (immune response) or Celiac (autoimmune response). My test revealed that I am in fact a Celiac. As disappointing as that is, it’s essential to know – if i want to live a long, healthy life and be here for my boys (10 years and 8 months old, respectively). This entry was posted in Celiac and tagged celiac on May 4, 2015 by Pamela. May is Celiac Awareness Month. And I am a Celiac. Celiac Disease is greatly misunderstood by the public. Journalists misinform, comedians mock it, and other celebrities mis-promote it as a fad diet. Enough! Just because we don’t keel over in anaphylactic shock after gluten consumption does not mean this isn’t a very serious condition – it IS! People are stunned when I tell them that celiac is an autoimmune disorder where the body’s immune system attacks the intestines, preventing nutrient absorption for at least 10 days. Dumbfounded sometimes, when it dawns on them what that really means. Often I am sharing that information with another mom to explain why both me and my child do not eat and gluten/grains or casein/dairy (due to cross-reactivity). At times people are empathetic, but most just dismiss it. NIMBY (not in my back yard), so to speak. More and more people are diagnosed with celiac or non-celiac gluten sensitivity every day, and it’s sad to think that’s the first they hear of the condition and its consequences. Or worse – that they don’t take charge of their health situation due to peer pressure and mockery or the fear of being different and/or ostracized. It really is a very serious condition, most commonly manifesting as nutrient deficiencies and related diseases. So let’s build awareness through support and education. Help by participating in the Twin Cities Celiac Walk on May 17th! And lots more in the links on my “RESOURCES” tab above. This entry was posted in Events & Activities and tagged awareness, celiac on May 1, 2014 by Pamela. For all my GF/Paleo Peeps in or visiting Minnesota: a restaurant with a focus on gluten-free eating. This place even has a dedicated gluten-free deep fryer for french fries and sweet potato fries. What a treat! Last Sunday we attended their Gluten-Free Expo and had an opportunity to try the smoked chicken wings, salt & pepper french fries and sweet potato fries. So Yummy! I can’t tell you just how special it was. It’s been nearly two years since I’ve had proper (sweet) potato fries due to gluten cross-contamination of fryer oil. So good we signed up for their card program and mailing list! This is the first area restaurant I’m aware of that focuses on safe gluten-free food. We’re proud of our Gluten Free options! When we made the commitment to move forward with offering Gluten-Free menu items, the first rule was that we would do it RIGHT! We continue to grow within that commitment and continue to develop additional menu items and procedures that allow us to meet our own expectations in hopes of exceeding yours! ​All of our dressings, pasta sauces and our condiment sauces including Lemon-Dill Sauce and others are homemade and are specially designed to be safe for Celiacs and those with general Wheat allergies! We’re also pleased to have a “dedicated” fryer which allows us to prepare Fries, Sweet Potato Fries and other deep-fried items in a GLUTEN-FREE method! Simply put, Ernie’s has put French Fries back on the menu for YOU! The menu links below are our “regular” menus. For all items that are “naturally” Gluten-Free, they are marked with a Gluten-Free Logo. There are many items which are not Gluten-Free but can be modified to be Gluten-Free. Some of those modifications are as simple as leaving the Seasoned Bread Crumbs off of the Scallops or leaving the Croutons off a Salad. We offer an outstanding Gluten-Free Pasta alternative to our regular pasta AND we also offer Udi’s Gluten-Free Buns. The cost for those modifications are listed right in the menus for your convenience! ​When joining us for a meal, please be sure to let your server know about your special dietary requirements so that we can ensure your safety. Menu perusal revealed a good selection of (GF) meat and seafood entrees in addition to the appetizers. Even though they are located across the metro from us, we will definitely be returning for Date Night soon! It’s worth the trip! Many Thanks to talk radio personality Jason Lewis for promoting the event and restaurant on his show. Apparently his wife is celiac and they really enjoy going to Ernie’s. See you there! This entry was posted in Edibles, Events & Activities and tagged celiac, dining out, EXPO, fries, gluten-free, restaurant on June 14, 2013 by Pamela. Valentine’s Day is Coming – Are You REDdy?! As many of you already know, I’m a HUGE fan of Red Apple Lipstick! Red Apple Lipstick has a shade of red for everyone. Red is THE color for Valentine’s Day! Pink is good too, but I love red for special occasions – and in my opinion, my 14th Wedding Anniversary qualifies. So let’s get “REDdy” with RAL! [And GUYS – don’t bail on me here! 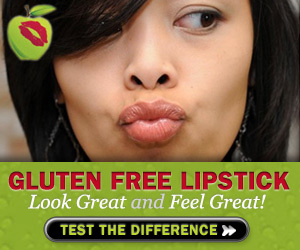 Gluten-free lip products are important to you too! RED! is the classic red that works on every skin tone. I am wearing it here. If you prefer a more muted red with brownish undertones, Strawberry Lips is for you. If you really want to rev it up with a vibrant blue-red, you want Rebel! It’s intense! Reddy Or Not is a hot-pink red. The best of both worlds. And Sunkissed is a brilliant orange-red to brighten your day. Wear any of these luscious shades and I guarantee you will be noticed! Remember: as a mineral-based lip product, the color is buildable from a soft hue to intense opaque color. Mineral-based products also do not stain skin and clothing the way dye-based cosmetics can. These lip products all have mouth-watering vanilla, fruit and mint scents to complement the beautiful colors. Red Apple Lipstick has 24 amazing colors to choose from in addition to Rallye Lip Balm, lip pencils and 14 lip glosses. Oh yes, and don’t forget the eyeshadows to complete the look! There is still time to ORDER your special Valentine Gift Box in PINK or RED! Do it NOW! This entry was posted in Beauty and tagged celiac, gluten-free, lips, makeup, paraben-free, Red Apple Lipstick on February 4, 2013 by Pamela. Valentine’s Day is fast approaching. Are you ready? My friends Jay and Andrea Harper at Red Apple Lipstick have created some gorgeous Valentine’s Day gift boxes in RED and PINK themes. I have raved before about the quality of these products. I just can’t say enough – they just blew me away the first time I tried them! They feel like a moisturizing lip balm and the mineral-based colors are beautiful, blendable, non-staining AND toxin-free. That’s right: NO gluten, soy or parabens. In addition to these lovely gift packages, Red Apple Lipstick has 23 lipstick colors, 14 glosses, 6 liners, and RALLYE Balm, the BEST lip balm on the planet! I use it on my lips, under my eyes and on my cuticles. And the eyes have it too! 26 mineral-based shades to choose from that can be applied dry or wet for a more dramatic look. Be sure to sign up for the VIP Club email list to get 20% off codes each month – the first one arrives IMMEDIATELY (conveniently located at the top of their web page). Free shipping for purchases over $25. Look for the many select-your-own discount packages in each category. It’s Beauty without the Beasties! This entry was posted in Beauty, Celiac, Uncategorized and tagged celiac, eyes, gluten-free, lips, makeup, paraben-free, Red Apple Lipstick on January 17, 2013 by Pamela. This article: The Paleo Mom: Gluten Cross-Reactivity explains in detail why I can no longer eat dairy and should avoid eggs whites. Very sad to see that chocolate may be a problem too. *sniff! * *sniff! * And I was so excited to have found a chocolate bar (TAZA) with no gluten, dairy or soy! This is something I have learned through trial and error, and Robb Wolf mentions it in his book “The Paleo Solution” under autoimmunity protocol. If you are gluten-intolerant or celiac, know that you must be aware of these possible cross-reactions. Cross-reactivity is very real. The other day I had a GF Caesar salad at my favorite restaurant, not thinking about the cream in the dressing and the sprinkling of parmesan shreds atop. The next morning I could not get my ring on my right hand. Clearly it triggered some inflammation. 🙁 I was so disappointed. This entry was posted in Celiac, Health and tagged celiac, gluten-free on December 7, 2012 by Pamela. This entry was posted in Celiac, Health and tagged celiac, PALEO on December 2, 2012 by Pamela.